Tammy Garcia is a renowned clay and bronze artist from Santa Clara Pueblo who hails from a bloodline of sensational potters. 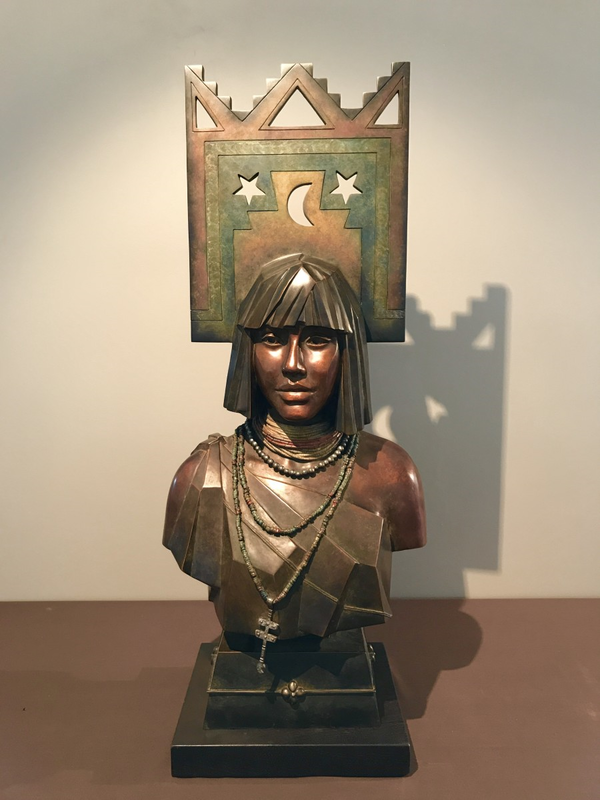 The spectacular legacy of artists includes Sister Autumn-Borts Medlock, Mother Linda Cain, Grandmother Mary Cain, Great-Grandmother Christina Naranjo, and Great-Great Grandmother Sara Fina Tofoya. At the ripe young age of sixteen, Tammy began her career making pottery and has continued her grand success for over thirty years. The artist gratefully acknowledges the fantastic history of her family and the beauty of the art form that has been passed down for so many generations. Tammy reflects, "I think it was an incredible opportunity to be born into a family of potters that goes thousands of years back. I've been asked is it in the blood, or is it this talent that you have to work for? I feel that it's both. You definitely are born with certain DNA and talents are passed on." Tammy's childhood spent surrounded by potters certainly played a role in shaping the artist. Tammy posing with "When The West Was One" in front of a kiln. Pottery was a part of Tammy's daily life growing up. The entire process was woven into the chores she completed as a child. Along with sister Autumn, the girls would help dig the clay from the hills of Santa Clara Pueblo and participate in the mixing process. The two would clean the fire pit after a piece has been fired. The girls not only learned from participating, but from observing and learning from her elders. Tammy recalls, "It was a part of family life, a part of everyday life. You learn so much by observing without even realizing that you’re learning, that it’s happening. But now I can see how fortunate I was to have this special training. I’m asked about my college training, and what my degree is in. To have my mother and my grandmother as my teachers, you know one on one is priceless. You can’t get that in a university or college." Growing up in a home with her mother making pottery had a huge impact on Tammy. Tammy credits her mother, Linda Cain, as one of her teachers. It was not only through pottery related chores and observation that Tammy and her sister Autumn came to appreciate the art form. Growing up in Santa Clara Pueblo, the sisters were surrounded by phenomenal potters. Tammy recalls one of the first paid jobs the girls did was for a renowned potter named Grace Medicine Flower. At around nine years old the girls were tasked with cleaning the woman's house. "We would go to Aunt Grace’s and we would be vacuuming and dusting next to a cabinet full of Joseph LoneWolf's pots, of Grace’s, and of Sara Fina’s. Grace’s house was like a museum and she trusted us young girls to be in her home cleaning. So we learned how to behave around the art. Pottery is fragile and you have to understand that. You certainly have to know your manners," says Tammy. Autumn and Tammy have carried these childhood memories with them into their careers. Sisters Tammy Garcia and Autumn Borts-Medlock posing with their bronze pieces "When The West Was One" and "Stellar's Day." Tammy wasn't always so keen to partake in the family legacy. In fact, at sixteen she wanted to do absolutely anything else and took a little break from clay work. After a brief stint in beauty school and a week working as a dishwasher, the teen felt that she should give pottery another try. Tammy explains, "It was after this when I looked at pottery a little more seriously and I’ve stayed with it ever since. I think it’s having teachers like my grandmother and my mother, who persevered and were able to support their families through pottery that I knew I had a chance as well." Tammy recalls, "In the beginning I wasn’t very good. I did have pieces break. You can spend months and months on a piece and it could break. It’s hand built. It’s not a machine made product. Being that it’s handmade and being how I was early in my career, I was still learning. I needed those pots to break to challenge me." Although it seemed a challenging form to master, Tammy has been making pottery ever since. Tammy Garcia showcasing a pot in the coiling stage. The fragile nature of pottery is something that Tammy taught her own daughters about as well. The mother of three remembers giving her eldest daughter, Leah, a cracked piece to work on when she was a young girl. At one point, Leah became frustrated while working on the vessel and threw it to the ground where it shattered into several pieces. She looked at the clay in shock at how easily it had broken and began to cry. Tammy reflects on that moment, saying, "After that point she was very careful with how she would carry it. With so much more respect that she had learned. I think you can teach so much more by experience. You know, it breaking wasn’t the end. You have to be able to know you can fix it and make it better. I think you have to be that open-minded. Especially working in clay because it does break. You have to learn how to be devastated and get over devastation. In the early years, a lot of my pots broke. I was in the learning the process. There’s risk involved. It's important to remember it’s a handmade piece." This is an important aspect of clay that requires patience and understanding. A bronze creation of Tammy's modeled after her eldest daughter and titled, "Leah." Tammy's positive attitude toward the fragile nature of clay stems from her upbringing. Tammy reflects, "When anyone would fire a piece we would usually all come together. Sometimes there might be an aunt, an uncle, a grandma. But it was a group effort because the creator needed help. If you were there the day helping out firing and a piece broke, sometimes you would be fortunate enough that someone older might say here, you can have it. You could glue the piece in. My first pieces were broken pots that were glued. Which I cherished just as much." The attitude of Tammy's relatives left a long lasting effect on the artist. Tammy continues, "Grandma Mary would say if a pot broke during the firing, that maybe my Great-Grandma Christina wanted it. She must have liked it so much that she wanted it for herself. She took it’s spirit back with her to the grave. This is how I learned how to overcome and deal with failure. When a piece would break, everyone from the family would pitch in advice. You know, try this and try that." Tammy Garcia posing with the front doors she designed at Hotel Chaco. Growing up in a nurturing environment that celebrated both successes and failures helped Tammy become the artist she is today. "Now I’m at a point where I could work blindfolded. So much is in the feel of the clay. Now I can definitely say that yes, I had a very rare opportunity to have grown up in the pueblo with my mom who made pottery in the home. The rest of the family who also created pottery. Being able to teach my girls. I tell my girls that they are lucky to be born with a royal bloodline. To have this clay as our heritage... It’s damn special," Tammy says proudly. The legacy of this fantastic bloodline is truly remarkable. If you'd like to meet Tammy and her family, please consider joining Gallery Chaco for a show celebrating their lineage. The event description and info can be found below. Join Gallery Chaco as three generations of immensely talented clay and bronze artists showcase their artistic legacy. Mother Linda Cain, daughters Autumn Borts-Medlock and Tammy Garcia, and Autumn’s daughter, Rochelle Medlock exemplify the powerful traditions of their lineage. The family has a strong connection to the clay, as renowned Tewa potters Mary Cain, Christina Naranjo, and Sara Fina Tafoya came before them. Come and witness these brilliant women whose artistic legacy reaches back more than seven generations.